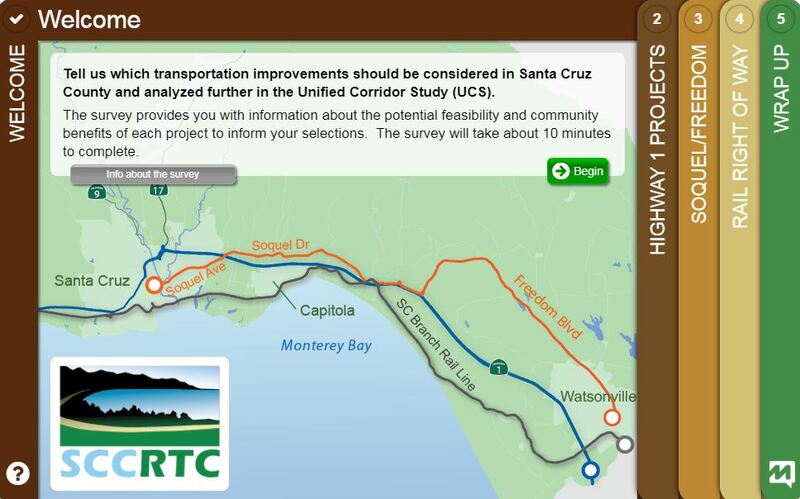 The RTC invites you to provide input on which transportation projects should be considered as future transportation solutions in Santa Cruz County and analyzed in greater detail in the Unified Corridor Study. The online survey provides information about the feasibility and potential community benefits of each project to inform your selections. Public input received as part of outreach efforts conducted in spring 2017 helped inform which projects were evaluated in Step 1 of the UCS scenario analysis. Step 2 of the UCS scenario analysis will include a more detailed evaluation of how projects advance sustainable transportation goals. The UCS identifies projects that serve people traveling by auto, transit, bicycle and walking and groups projects into scenarios on Highway 1, Soquel/Freedom and the Santa Cruz Branch Rail Line. Please provide your input by November 8. The RTC is scheduled to decide on the transportation scenarios to advance to the Step 2 scenario analysis at the Regional Transportation Commission meeting on December 7, 2017 at the County Board of Supervisors, 701 Ocean Street, Santa Cruz. Provide Input on Draft Step 1 Analysis – Take the Survey!